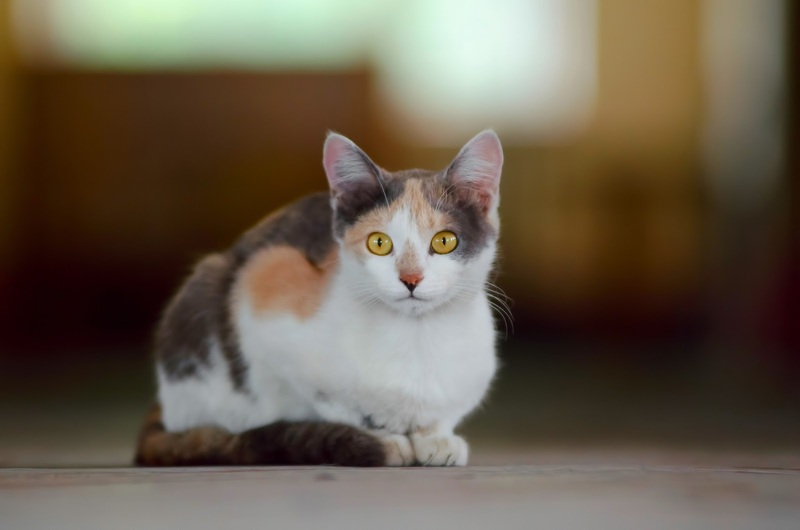 Killer Characters: Hello from a Cat Named Mouse! Hello from a Cat Named Mouse! 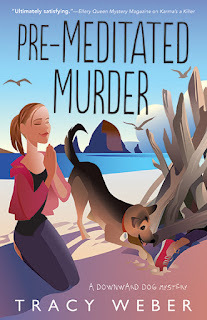 By Mouse of Tracy Weber's Downward Dog Mystery Series! Hi there. 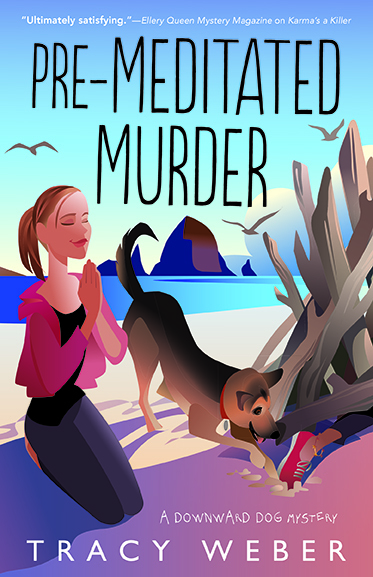 I’m Mouse, a feline in author Tracy Weber's upcoming mystery, Pre-Meditated Murder! Yes, I realize Mouse is a silly name for a cat, but what can I do about it? No human can pronounce my real name. It’s a mixture of meows, head bumps, and purrs. So, since the human who catnapped me named me Mouse, I guess it will have to do. I’m six months old and I live at CB Cuts, a hair salon in Cannon Beach, Oregon. Some people call me a Hemmingway cat; others call me polydactyl. I don’t know what either of those words mean, but people always look at my front paws when they say them, so I assume they’re talking about the fourteen cool toes I have on my front feet. I used to live in the courtyard downstairs. In some ways that was more fun, because I could wander anywhere I wanted to. Now I’m stuck here with only a large room and my extra special hiding place. Mostly, though, living outdoors by myself was scary, hungry, and lonely. Crystal (the human who trapped me) says I’m semi-feral, but she’s hoping that she’ll be able to tame me someday. Good luck with that. Crystal’s been upset the last few days. An old friend of hers named Michael came back to town, and a few days later her best friend, Gabriella, was murdered! I’d met Gabriella a few times. She was OK, except when she tried to touch me. I do not like to be touched. Do you blame me? The last time I let Crystal touch me, she threw me in a cage and incarcerated me here. Crystal doesn’t really like Kate, but I think she’s OK. Kate’s the yoga woman with the bad haircut who’s trying to solve the murder. Kate and I will get along fine as long as she doesn’t try to pet me. If that pointy finger of hers gets within six inches of my fur, I’ll scratch it off. And with seven claws on each front foot, I’m an Olympic-level scratcher. Do you think I’ll have to teach her a lesson? Say hi to Mouse and tell her about the cats in your life! Leave a comment below by Tuesday, October 17, and you'll be entered to win an autographed, advanced copy of Pre-Meditated Murder. Hi Mouse! How are you? I don't have a sweet little kitty in my life right now. I do have a little dog at home. Do you like dogs? Hello Mouse, I have two cats right now. They really belong to my daughter. She is in the Peace Corps in Moldova. They miss her but are doing OK with us. My, you are a beautiful cat and I love your name. I don't have a Mouse in my house at the moment. Have you met Bella? I'm sure you would become great friends, eventually. mlarkin(at)rmrgroup(dot)com. I have a couple of barn cats that were rescued around Christmas time. They are litter mates and look so much alike we use different colored collars to tell them apart. The female is named Merry and the male Chris. Hi from Mouse! I would like a dog as long as it respected my God-given right to rule over it. I haven't met Bella yet. Do you think she'll like me? Hello Mouse. My cat Pita is my love bug. She's a lap cat, and she's very entertaining. She runs around the house and plays with her toys. I wouldn't trade her for anything in the world. Thank you for this chance! Hi Mouse. My two kitties are Oreo (who now owns my roommate) and Bo. Oreo IS A torti, with torti-tide, and Bo, a tuxedo. They are both strong individuals. Hi Mouse---my cat Malachi thinks he's a dog and washes the faces of both my dogs. Dear Mouse, I have had kitties in my life almost forever. I like dogs, but cats are really my animal. I now have a 1 year old granddaughter and am reminded how much alike little children and cats are! I got her a onsie that says: Help! I'm a cat trapped in a human body! Hi, Mouse. My sister has two black cats she adopted from a shelter earlier this year.. Toby is very friendly while Belle is on the shy side.I take care of them whenever she has to be away from home. Hi Mouse - My black n white cat named "Puffy" probably thought the same thing about his name - but heck I was seven when I named him - does your human have that excuse? ha- teasing! I think Mouse is a very sweet name and I do not think Kate has a bad haircut LOL! Hi Mouse! I had a cat named Mouse too. She was a great cat and I lost her last year after 19 years together. I miss her everyday, she was a great friend. I adopted two kittens earlier this year, Hamilton and Jefferson, and they really keep me laughing. I'm sure Mouse sent them to me to keep me company. They are great cats! Hi Mouse , I have a tortie cat whose name is Minnie, but I often call her Minnie Mouse. She has a sister named Abbie. Minnie's brother did not like to be touched either, so I understand where you are coming from. Hi Mouse, I am without any cat friends right now. Hi Mouse! I grew up with a sweet Siamese named Velvet. Hi Mouse, My daughter just got me two kittens for my birthday: Lewis and Phoebe. We have other rescues: Slinky, Pewter and Skipper. Hi, Mouse. Right now there are only two cats in our house. My son and DIL have Himalayans named Saku and "M". They pretty much rule the roost in their part of the house. They rest of the house is owned by the dogs. Thanks, everyone for participating! The winner is Nancy Luebke! Nancy, e-mail Tracy at Tracy@WholeLifeYoga.com to let me know the address to mail your book. I hope you love it!